SPJ DePaul won three awards at the Eighth Annual Leadership and Involvement Celebration May 30 on the Lincoln Park Campus. SPJ DePaul also was a finalist for Organization of the Year, an award it won in 2011. The competition is sponsored and judged by DePaul’s Student Leadership Institute and the Office of Student Involvement. There are more than 300 registered student organizations at DePaul. Region 5 chapters and leaders received numerous awards at the Excellence in Journalism 2011 Conference in New Orleans. Al Cross, former Region 5 Director and SPJ national president in 2001-2002, received the Wells Key, the Society’s highest honor. Tara Puckey, founding president of the Indiana University-Purdue University Indianapolis SPJ chapter who also served two years as a student representative on the national board, received the Julie Galvan Outstanding Graduate in Journalism Award. The award is based on character, service to the community, scholarship, proficiency in practical journalism and contributions to the student’s SPJ chapter. The Chicago Headline Club was named the national large chapter of the year and the DePaul University chapter was named the national student chapter of the year. The Chicago Headline Club also took home three Circle of Excellence awards in the FOI, diversity and professional development categories. One more distinction for Region 5: Three of the 12 student staff members selected for The Working Press, the conference’s daily newspaper, attend universities in Region 5. The are Mary Barczak, Eastern Kentucky University; Corinne Chin, Northwestern University; and Olivia Ingle, Butler University. Please see the invitation below from former national SPJ President Al Cross. A reply card follows the invitation. This is your special invitation to the inaugural Al Smith Award Dinner, to be held Thursday, June 2 at Fasig-Tipton Kentucky, the horse-sales pavilion a half mile north of Interstate 64/75 on Newtown Pike in Lexington. The Al Smith Award will be presented annually to a journalist or publisher who has demonstrated public service through community journalism in Kentucky, or anywhere by a current or former Kentuckian, with preference given to those outside metropolitan areas. The award’s first recipient will be its namesake: Albert P. Smith Jr., who owned weekly newspapers in Kentucky and Tennessee, was founding host of KET’s “Comment on Kentucky” and was main founder of the Institute for Rural Journalism and Community Issues, which is co-sponsoring the award with SPJ’s Bluegrass Pro Chapter. The Bluegrass Chapter conceived this award, is co-sponsoring the dinner, and will receive 25 percent of the net proceeds from the event. Sponsorships are also available, via the attached reply card. Just send a check made out to the University of Kentucky with “Rural Journalism” on the memo line and send it to the address below. Please make your reservation by Thursday, May 26. This event will benefit the endowment of the Institute for Rural Journalism and Community Issues at the University of Kentucky and the Bluegrass Chapter of the Society of Professional Journalists. Contributions to the endowment through July 11, 2011will be matched by the Commonwealth of Kentucky’s Research Challenge Trust Fund. ___ I can’t attend, but enclosed is my check to the University of Kentucky. May 26, 2011. Donations are tax‐deductible except $60 per ticket, which will fund costs of the event andSPJ’s share of the proceeds. Questions? Call IRJCI Director Al Cross at 859‐257‐3744. My Future in Journalism: Do I have one? Students from the Loyola University Chicago SPJ chapter asked this question of top journalists in the Midwest and the result was a video Kristen Thometz, chapter president, and Jessica Cilella, vice president, presented at the SPJ Regions 4-5 spring conference in Northern Kentucky April 1. To view the video, click this link: My Future in Journalism: Do I have one? 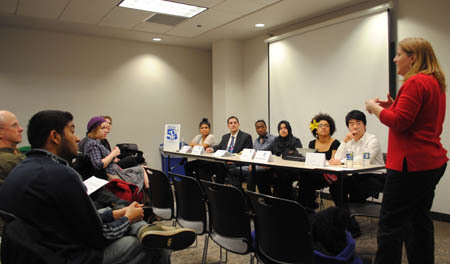 SPJ DePaul partnered with three other university student organizations to host a panel discussion entitled “Who’s News? Achieving Diversity in Media Coverage and the Newsroom” on Feb. 17. 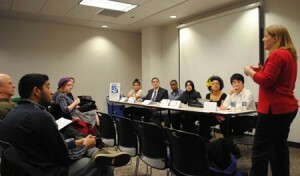 The forum, moderated by Karen Kring of the Association for Women Journalists Chicago, involved six panelists and drew a crowd of more than 40 people. The Korean Student Organization, Act Out and the Inter-Tribal Student Organization co-sponsored the event, which was live-Tweeted using the #SPJchat and fielded questions from a social media audience.